Warriors rumors: Could team land Carmelo Anthony? 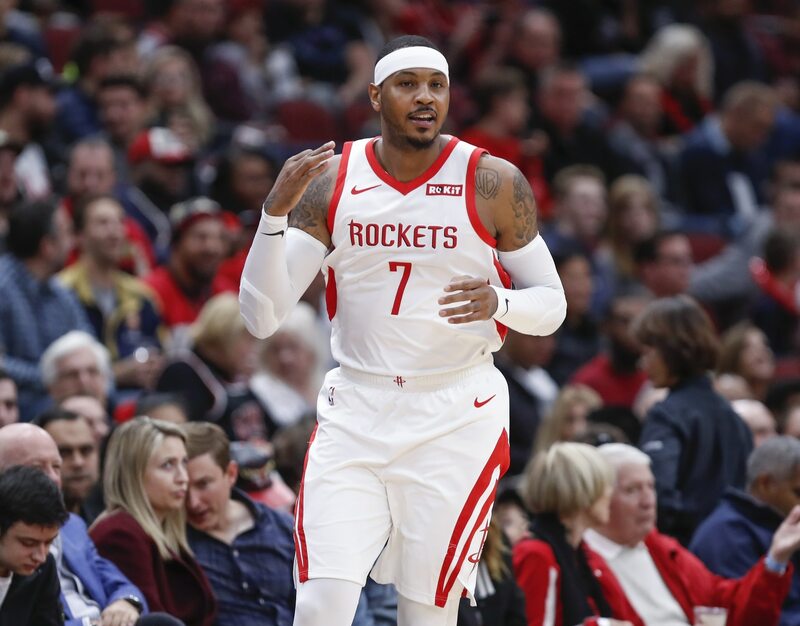 Now that 10-time All-Star Carmelo Anthony is set to hit free agency after being traded from the Rockets to Chicago, there’s going to be a lot of rumors surrounding his potential landing spot. Anthony, 34, is nowhere near the same player that led the Association in scoring back in 2012-13. He played all of 10 games with the Rockets — proving to be a bad fit for the team. That came after Melo didn’t fit in well with Russell Westbrook and the Thunder last season. Even then, there’s going to be a market for a future Hall of Famer who is averaging a robust 24.0 points per game throughout his career. Here are Anthony’s five-most likely landing spots. This one goes without saying. LeBron James has already expressed interest in Anthony joining him on the Lakers. Both members of the 2003 NBA Draft class, the two are considered best of friends. Though, they have never suited up with one another outside of the NBA All-Star Game and international competition. Los Angeles’ potential interest in Anthony is muddied by the fact that the team has two solid young forwards in Kyle Kuzma and Brandon Ingram. The Lakers also don’t want to waive a guaranteed player to create a roster spot for Anthony. Should a spot become available, they’ll be a legit possibility. After moving both Robert Covington and Dario Saric in the Jimmy Butler trade, Philadelphia certainly has a need for another wing. Guard Ben Simmons has played the point forward position at times this season. Though, he’s more comfortable at his normal position running the offense. Outside of that, there’s not a whole heck of a lot to look at from the three in Philadelphia. Wilson Chandler has not fit in well after being acquired from Denver during the summer. While Anthony certainly wouldn’t start for the Sixers, he could become the team’s top option off the bench. That makes this a solid potential fit. Outside of Damian Lillard and C.J. McCollum, there’s not a player on Portland’s roster averaging as much as 15 points per game this season. It’s this reliance on these two back-court stars that has these Blazers as afterthoughts in the Western Conference. Would Anthony change that on a dime? No. He would, however, add another capable scoring wing to the mix. As of right now, Jake Layman is the Blazers’ leading scorer at the three — averaging 6.6 points per game. Sure Evan Turner plays small forward at times, but he’s not much better. Anthony would be a vast upgrade on offense. That’s for sure. Every single big-name player will be linked to the two-time defending champs until their dynasty comes to an end. Does this mean Anthony is a fit in Oakland? We’re not too sure. Golden State already boasts one of the game’s best players in Kevin Durant at the three. Former NBA Finals MVP Andre Iguodala has also come on strong as of late. The Warriors were saving the veteran for their late-season and playoff push. He’s now healthy and rested. This isn’t to say Golden State wouldn’t kick the tires on Anthony. The team has a roster spot it’s been keeping open for the buyout market. And while the focus has been on the center position, DeMarcus Cousins’ return to action creates more depth there.